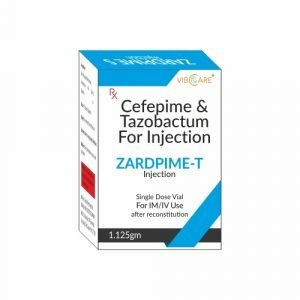 Cefepime is a fourth-generation cephalosporin antibiotic developed in 1994. Cefepime has an extended spectrum of activity against Gram-positive and Gram-negative bacteria, with greater activity against both Gram-negative and Gram-positive organisms than third-generation agents. Cefepime is usually reserved to treat severe nosocomial pneumonia, infections caused by multi-resistant microorganisms (e.g. Pseudomonas aeruginosa) and empirical treatment of febrile neutropenia. Symptoms of overdose include seizures, encephalopathy, and neuromuscular excitability. For the treatment of pneumonia (moderate to severe) caused by Streptococcus pneumoniae, including cases associated with concurrent bacteremia, Pseudomonas aeruginosa, Klebsiella pneumoniae, or Enterobacter species. Also for empiric treatment of febrile neutropenic patients and uncomplicated and complicated urinary tract infections (including pyelonephritis) caused by Escherichia coli or Klebsiella pneumoniae, when the infection is severe, or caused by Escherichia coli, Klebsiella pneumoniae, or Proteus mirabilis, when the infection is mild to moderate, including cases associated with concurrent bacteremia with these microorganisms. Also for the treatment of uncomplicated skin and skin structure infections caused by Staphylococcus aureus (methicillin-susceptible strains only) or Streptococcus pyogenes and complicated intra-abdominal infections (used in combination with metronidazole) caused by Escherichia coli, viridans group streptococci, Pseudomonas aeruginosa, Klebsiella pneumoniae, Enterobacter species, or Bacteroides fragilis.